I lied! I didn’t think I’d be able to get this post up, but the old desktop wheezed and huffed and here it is! 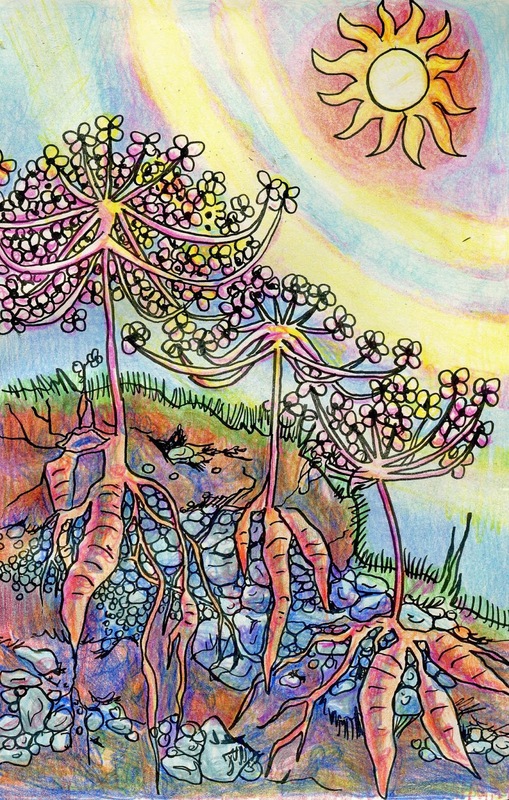 The Friday Fun & Easy Landscape Challenge 3/9 -3/16: Draw a landscape with Wild Carrots. Extra calorie-free brownie points for using the Big Rocks step-out. What’s fun about today’s outing is that we’re going to explore the landscape under the ground as well as above. The Wild Carrot aka Queen Anne’s Lace is believed to be the precursor to the domesticated carrot. It looks different according to the season, and realism isn’t what I aim for, so my Wild Carrots are similar but not exactly like the real ones. This step-out isn’t difficult but it’s complex, so I’ve broken it down into three parts – the petals, the stem & head, and the carrots and roots. The petals are nothing unusual. In essence, this is just a close up, so that you can concentrate on others things when drawing the actual flower. I focused on the black (purplish) dot that Wild Carrots have, because it is one way to tell them from a lookalike plant – the poisonous hemlock! Very important, that black dot. Feel free to add more petals, change their size and shape – let your unique flag fly! This is the basic Wild Carrot plant, and you could stop with this if you don’t want to go underground. Don’t sweat the placement or number of the stems. The overlapping is the important part. The plant head is just layers of petals. 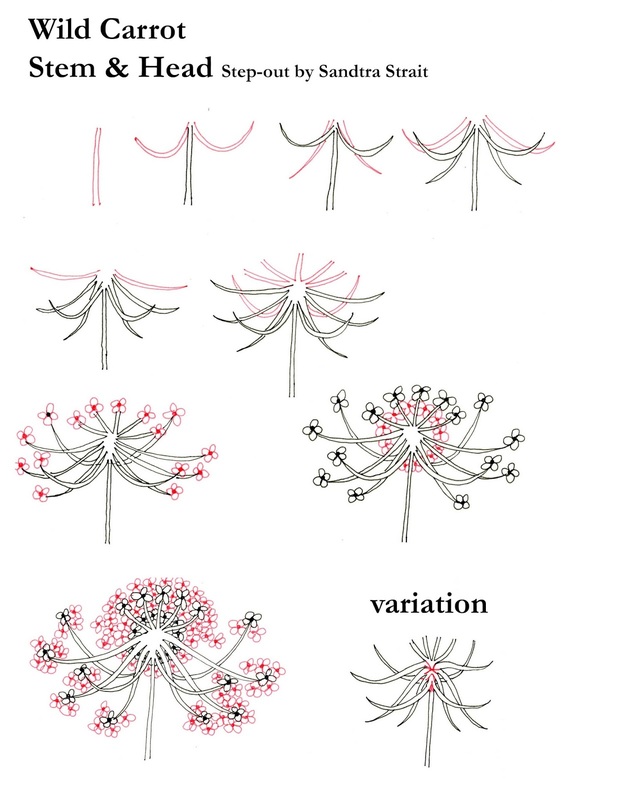 They should overlap too, so some of them will be partials petals. Again, don’t sweat the placement. Feel free to add fewer stems or petals or more. Make them thicker, longer-whatever you feel like doing. You can also stop after this Let you your unique… well you get it. As above, so below! Don’t sweat the size, shapes or placement. Every animal and plant in the world is unique, and your drawings should be too. Drawn with Zebra Pen Zensations Brush Pen, Colored with Zensations Mechanical Colored Pencil in a Mother Leda Medium Art Sketchbook.